French Emblems: Emblem: Virtus difficilis, sed fructuosa. Virtue is hard, but fruitful. In torulis dulces cui stabulant nuclei. Dulcibus ast eadem fructibus illa scatet. You [the picture] show the famous fruit of Cybele [the pine cone], covered with a hard shell, Whose sweet kernels reside within the fleshy parts inside. Difficult wisdom is hedged about with sharp stones; But at the same time it is bursting with sweet fruits. 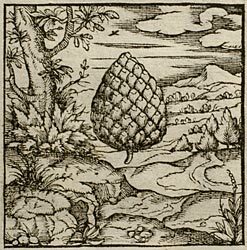 I don’t imagine that anyone does not know that the Pine-cone, which in the superstitious days of antiquity was held sacred to Cybele, has an uneven, bumpy, rough surface, which as it were climbs in a number of small steps of amazing toughness, which are almost impossible to break off at the join [lit. into flaps] unless you force them to by subjecting them to fire, at which they reveal hollowed-out pits, in which you find sweet kernels, of great use in treating a variety of maladies of the body, and these are called both coni and strobili by the experts. If I’m not mistaken, most honoured Tennerus, you showed this to me once at your house as being your family crest, when you most honourably accepted the summons from the king to Denmark, having put just that emblem into a device all of silver. I think that this symbol simply shows that from virtue and learning, and all wisdom (which does not come by accident but through hard work) comes the sweetest fruit of all, which brings to the wise man the most pleasant recollection of long hours spent in his labours. 1. Hieronymus Tennerus, chancellor of the King of the Danes (Frederik II, reigned 1559-1588). 2. This passage contains an unusual number of highly obscure words, even by Junius’ standards. In particular, colliculus (‘little hill’, used by Junius to mean one of the scales of the cone) is a diminutive hardly ever found in classical Latin; as is torulus (‘little pit’). Lacunatos torulos is a phrase adapted from Pliny, Natural History, 15.10.9.35; lacunatus is another very rare word, Pliny’s use of it in this sense being possibly a hapax legomenon. Scansilis is a rare formation, literally meaning ‘climbable’ (presumably Junius has some image like a wooden staircase in mind), whilst valvae refer to the folding halves of Roman double-doors; it seems not to have been used classically in any other sense, though the diminutive valvolae was used in a botanical context to refer to pods etc. that appeared like double-flaps. Conus does not apparently appear in classical Latin with the meaning of pine-cone (see Lewis & Short), though κωνος does have this meaning in Greek; strobilus is a Greek word, having the meaning both of pine-cone and pine-kernel in Latin, though in Greek, στροβιλος seems to refer exclusively to the cone. From the grammar, Junius clearly intends both to refer to the kernel (as well, perhaps, as the cone).